This beautifully illustrated children’s book introduces us the interesting entertaining story behind Chinese zodiac. In old times, cat and rat are great friends. One day the Emperor announces a contest, a race for all the animals. The first 12 winners cross the finish line will have a year named in their honor. The contest is through mountains and fields, forest and rivers. Rat and Cat, the best of friends, ask the water buffalo to carry them across the river. However, when it’s about to reach the finish line, rather than holding together tightly, Rat pushes Cat into the water and jumps off the buffalo’s back, coming in first. 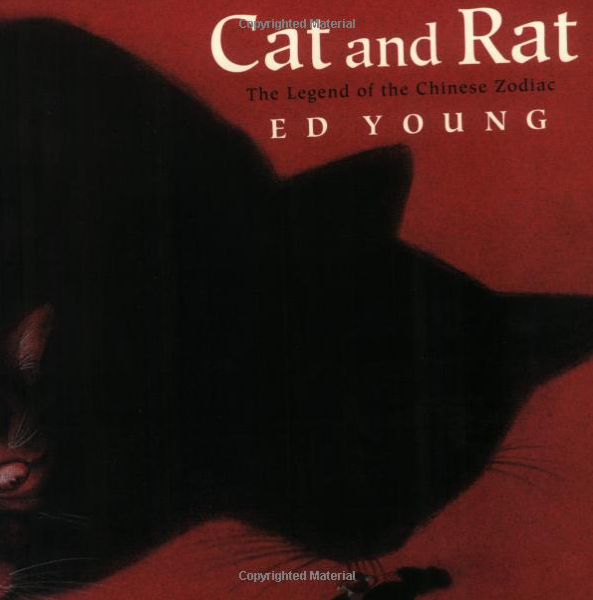 This marvelous tale reveals why, to this very day, Cat and Rat are enemies and why Cat is not one of the 12 animals of the Chinese zodiac. Following the story, Ed Young offers “Cultural Notes” and a chart of signs that help the reader understand the characteristics of the 12 animals described in the book. It is a cultural educational book especially for those who enjoys myths from around the world. It is very well presented by a soft gentle abstract look, Young’s charcoal and pastel drawings are dramatic and striking. The darkness of color and the depth of texture conveys a unique look in children’s literature. Jun13June 13, 2014 • By Helen H. Wu • This entry was posted in Book Review and tagged Book, Book Review, Cat and Rat: The Legend of the Chinese Zodiac, Children's Book, Chinese zodiac, Ed Young, Picture Book. Bookmark the permalink. nobody else realize such precise about my problem.